I think its time to close the chapter on my iPhone App case study. I began this public project of building an iPhone app over 2 years ago. 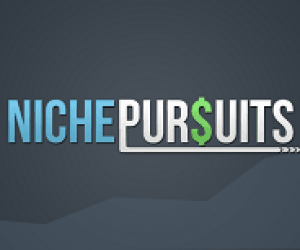 In fact, it was the original, “niche pursuit” on my blog here. Essentially, I allowed everyone to vote on a small business idea that they would like to see me pursue publicly. You can see the original post and survey results here. So, 2 years ago, I decided to build an iPhone app. I completed the App about a year ago. You can read all the posts leading up to and post creation of the app to catch up. I learned a great deal through this process, but today I'm ready to give the final update. I have removed the app from the app store, and its no longer for sale. I want to share the losses associated with this venture, and why I've closed this business venture. 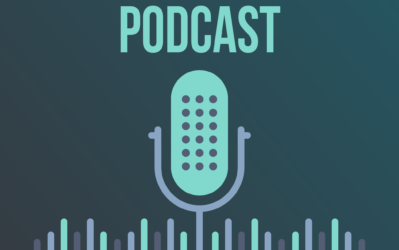 I was very excited to try building an iPhone app, because I had read the success that Pat Flynn, Benny Hsu (listen to my podcast with Benny here), and many others were having in the iPhone app business. I had no experience in this area, but I decided to hire an iPhone app developer to complete the programming, and I would be the idea and business man behind the project. I also knew there was a TON of competition on the Apple App store, so I wanted to create a “niche” application (sound familiar?). One where I could be the top dog in a small market – yes, just like my niche websites. I also wanted to create something that I found useful. So, I created the AdAlert App. You can see what the app is all about right here. 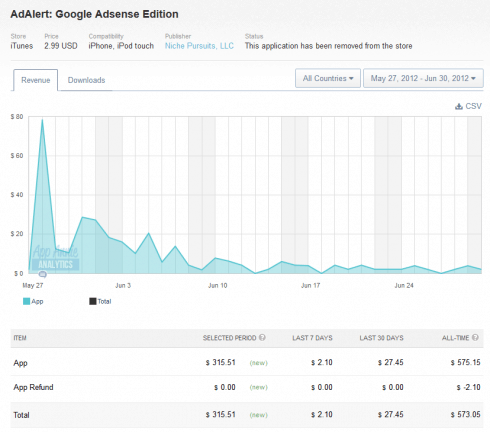 Essentially the app allowed users to quickly check their Google Adsense earnings. But the unique feature of the App, was that it would make your phone play a sound automatically each time you earned a certain amount in Adsense. So, if you set your app to go “cha-ching” every time you earned $5, it would do so hands free. I gotta say, I loved the app…as did others! 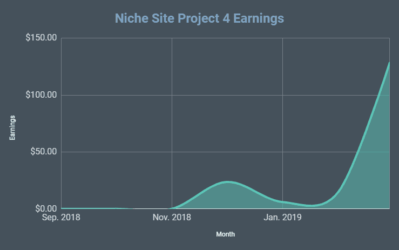 The app was programmed in a way that the user input their Google Adsense details, and the app would query their Google Adsense account approximately once an hour to see if a new earnings target had been achieved. All of these queries to Google were processed through my server. As the number of users grew, so did the number of queries all going to Google from my 1 IP address. As a result, it wasn't long before Google actually blocked my IP address from performing these queries. Because of this, the app was no longer able to send the sound notifications…which was its primary selling point! Ughh. So, I worked with my developer to try and resolve, but it became clear that even if we added more IPs, etc – we would continually be playing cat and mouse with Google. And rather than invest several thousand dollars more trying to figure out how to “fix” the app, I decided to pull the app from the App store. In addition, part of the reason I decided NOT to invest in fixing the issue, is because it was clear that I didn't have a huge winner on my hands. Let me break down the profit and loss of my first (and only?) iPhone app venture. 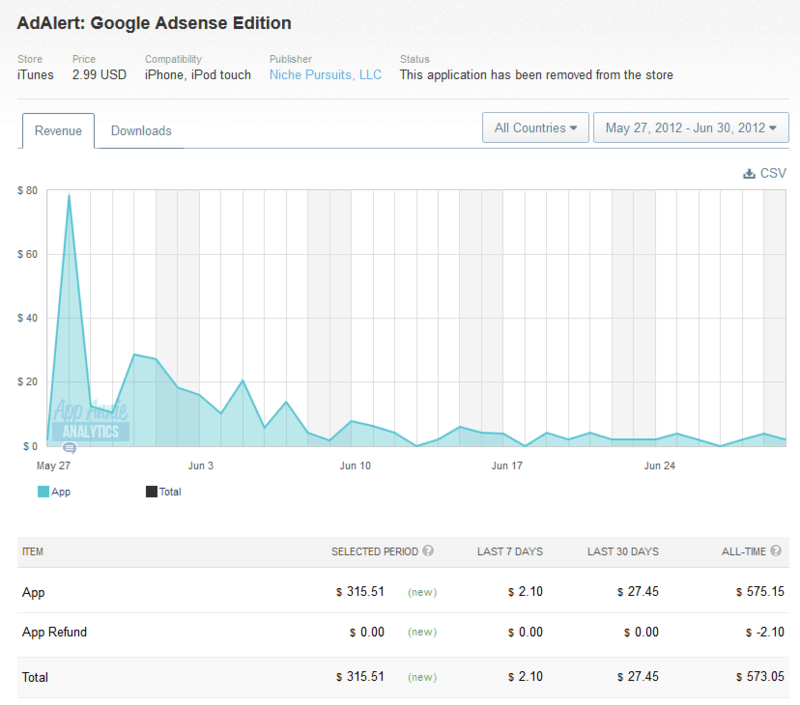 My AdAlert iPhone app cost me, $2,880 to develop. Not a huge investment, but not chump change either. I found the development team on Elance.com, and overall I was happy with their work. However, the issues that came along were something unexpected, and they couldn't find an easy fix. So, how much did the app earn? Well, not enough 🙁 . 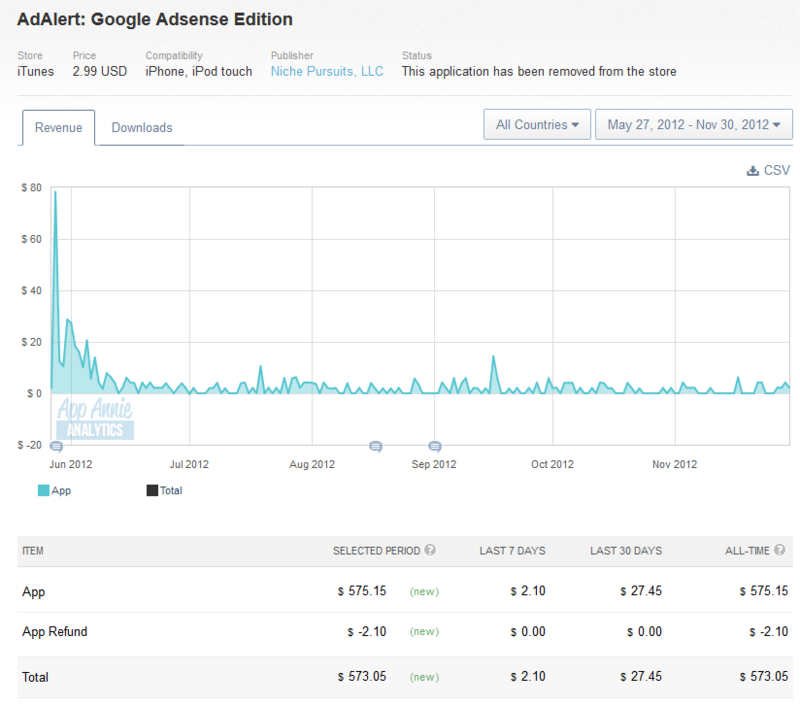 Here is what the app earned during its existence from May 27th, 2012 to November 30th, 2012. (I removed the app on Dec. 1st). In total, I sold $573.05 of my iPhone app. Here is what the sales looked like the first month or so. So, most of the sales came in the first month: $315.51. However, I also wanted to show what a more “typical” month would be. So, here is a screenshot from the month of July. The app sold $65.31 worth. So, I likely could have expected to sell around $65 to $70 per month of the app without any additional promotion; or about $800/year. I believe the sales were mostly coming internally from the app store at that point. However, if I would have continued to promote on my blog and perhaps in other locations, I likely could have gotten the average sales volume up to $200 a month. That's just a guesstimate; but as you can see – even if it was making me $200/mth, it would have taken over a year just to make my money back. Because I could see that I would likely have to invest another couple of thousand dollars to get the app working properly again, and I could see that the sales were not going to be stellar, I just let the application go. In hindsight, I could have done several things differently and learned other things with my first iPhone app venture. First, I could have done more research to verify that the app would function properly with a large group of users. I will say in my defense, that I DID indeed do lots of research and had many back and forth conversations with a few different developers. I asked specifically about the feasibility and functionality, and while some questions were brought up – the issue that eventually killed the app – was never one of them. I was going into somewhat uncharted territory (at least to the app developers I talked with), so it was hard to predict all of the issues that might come up. Second, I could have done more to promote my app. I mentioned it on my blog, and that's about it. I actually had plans to do much more, but as explained, issues started to arise a short time after releasing the app; and therefore, I didn't want to heavily promote something that I wasn't sure was going to be around. Third, while I do think that money can be made in the Google Adsense iphone app niche, I could have picked something with bigger market potential. This is a tough one, because I am a firm believer that dominating a small niche is much better than being a nobody in a big niche. However, it also quickly became clear that I was never going to make thousands a month with this app – and truthfully that was never the point. I was really hoping for a few hundred dollars a month; more as a way to prove the concept. Then I was going to go back and develop more apps. While I don't think I would ever recommend creating a game that competes with Angry Birds, etc – I think its important to do your market research and find a happy middle ground somewhere. Find a niche that its not overly saturated, but also provides upside potential. Finally, I learned that competing on the App store is a tough business. Sure there are lots of success stories out there, but there are also many failures. I interviewed Pat Flynn before I launched my app here, and he explained that he had close to 30 iPhone apps (if I recall correctly). While some of these have been profitable, some of these have not been. You can see that he earned $2,618.92 last month according to his income report here. Don't get me wrong, I would love to be earning over $2,600 a month from iPhone apps, but you can see that is no small task and may take lots of apps to accomplish that. Overall, its hard to share a business failure so publicly. However, I've learned a lot through the experience; so perhaps the loss was only financial. I think its also important for me to be realistic and share that not every business venture is going to be profitable. Most certainly I've had a few failures including this one. Niche Website Building has been very profitable for me (how I quit my job originally). Long Tail Pro – my keyword research tool has been very profitable. 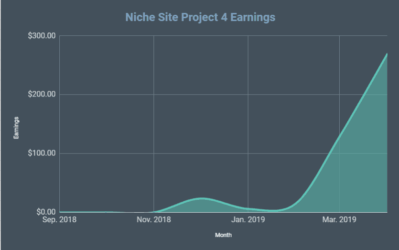 The Niche Website Theme – is a profitable product. (The theme I used on my public niche site project). Long Tail Classroom – is a profitable product. (My new video training course for finding low competition keywords and building niche sites). I've had other failures in business, that perhaps I can discuss another time; however, overall the winners have FAR outweighed any looser. The saying of, “no risk, no reward” really is true. So, will I dive into creating iPhone apps again? I don't know. The thought hadn't crossed my mind until I read a post recently written by Sunil over at ExtraMoneyBlog.com, where he explains the exact steps and success he is having with a couple of his iPhone apps. The business can be profitable, and perhaps I just need to try again. If inspiration strikes, I just may go in for round 2. I'll keep you posted! I would love to hear your thoughts, comments, or questions below. Please let me know what you think! Niche Site Project 2: Income Report for March 2014! As some one who is currently building an app, this post was very interesting Spencer. What I love most about this whole thing, is that you don’t regret it. You recognized that your only loss in the whole project was financial. Even though it did not turn a profit, I found this post pretty inspiring, man. Thanks Reggie! Glad you found my experience interesting and inspiring as well. You make a great Point Reggie. Learning from your mistakes is a huge part of the learning process. I recently had an experience when I learned why something wasn’t working and it made a world of difference. The same could be applied here in terms of iphone apps. You try it, you win or lose and you learn. Thanks for sharing the details behind the app. I liked the concept behind the app and I too liked the sound effect option. At the time though I didn’t have enough income coming in to even make it ding. Regardless of the end result, you’ve learned from the process and if you do decide to create another app in the future, you can build on this “failure” (which I put in quotes, because it’s not really a failure, but a learning opportunity). Kudos to you for stepping up and acknowledging the loss and sharing your experience with us, so that others can benefit from it. Thanks again for sharing, and I wish you nothing but the best! It happens, but you are absolutely right. A failure is just another opportunity to learn. Many failures I’ve had have taught me tremendous lessons. So don’t let it get you down, just use it and get better. I actually just wrote about a mistake I made with my niche website case study, so it happens to everybody. As to your first point about asking more questions, unfortunately, I’m not sure asking developers is always a great thing. Developers, especially freelancers, don’t get paid telling people something can’t be done. Not that developers are bad people but they focus on the technical challenges rather than the foreseeable business realities (i.e. Google’s reaction to hundreds or thousands of requests from a single IP). Great point Bill. And because I was stepping into new territory (as far as functionality), it was difficult to find answers online or from developers. Although, I will clarify a bit – in the fact that I’ve had lots of great freelance developers tell me about things that couldn’t be done. So, there are lots of great contractors out there that do indeed tell you the good and the bad. But it’s difficult because coding an app and planning an app are two entirely different skill sets. Sometimes you find someone who can do both but mostly people are either good at one or the other. Thanks for sharing this info. It always seems so easy when you look at others from the outside. These are good lessons and will hopefully help others. I am currently in the planning stages of an app I’m creating so this info is valuable. Thanks again. I addressed this specifically (about games); I’m not sure that the best niche to go into (tons of competition). Sure, there’s tons of money, but most games are not successful. Thanks for sharing – not everything can be a winner! It’s risky too building something around Google’s reporting. I learned today that Google is getting rid of it’s Keyword Tool and I’m sure that will cause many software and app developers to rewrite their programs which relied on it. Yes, Google now has a “Keyword Planner” which works very similarly to the Adwords tool. Most app developers will have no problem making the minor adjustments/updates needed to their respective software applications. I’m curious, is the $2500 range the norm for building an app? Obviously the more that goes into it the higher the cost, but I see a lot of blogs where people are spending around $400 or so developing an app. Yes, I think $2500 is not out of the norm, and is probably on the low end actually. Sure, there are some apps that can be done for less. But most are much more expensive. In fact, many apps are well over $100k to develop. Really? I don’t do any kind of native, mobile app development, but as a web developer, it sounds like you way overpaid. 3) played a sound file based on the data from Google. Maybe there was more to the app that you didn’t mention here , but otherwise, that’s (if I was building a web application to do it) a day’s work *at most*. That makes $2500 one heck of an hourly rate. Thanks for the reply Spencer, just out of curiosity are you willing to share the info of the app developer? I have a few app ideas and I don’t mind paying a little more if the developer is good, and you mentioned you were happy with them. You can contact me privately, but so you know, the developer was a very mid-range developer – there are much higher end/higher quality developers than what I had. (Many bids were much higher than what I paid). Hey man, maybe the non-monetary value you received from the lessons learned post-“failure” will end up exceeding the monetary losses. I’m sure your next apps will only continue to improve as a result of the lessons learned, and you will eventually make that $2k back (and hopefully more!). Good post, nothing wrong with admitting failures. Seems like this would have been a tough app to work around with the IP issue. I wonder if it would be worth selling the base app as is for someone else to continue where you left off if you don’t plan to develop it further? Might be able to recoup some of your costs. I would totally download that app now that I’m getting more into building niche sites (Thanks to your site and Pat Flynn’s success). Thanks John – decent idea on selling the base code of the app. The problem with building and selling mobile apps is that the margin is so low that niche markets are unprofitable. If you’re not making $50 a pop, it’s hard to justify the development costs. But who want’s to pay that much for an app? Perhaps a different approach is to build an app that integrates with Long Tail Pro where users can have a simple API to do research while away from their desktop. If it increases LTP sales, it would be worth developing. I am currently working on the designs for an app and have been quoted around the $500 to complete the work on Elance. This seems massively cheaper than you paid which concerns me. Although it is essentially just an alarm clock with a niche twist. 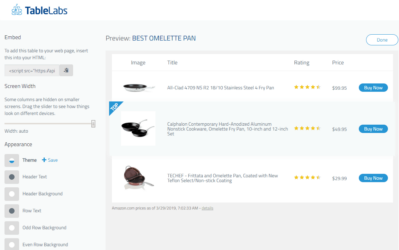 Do you think I will end up with a poor quality job? Its hard to say; it all depends on the functionality required. My app had some more complex functions that required in depth coding. If all the bids on Elance were in the $500 range, but if you just selected the cheapest bid – it could be a concern. They varied anything between $200 (which seems crazy) right up to $1,500. Te developer at $500 had very good feedback from previous clients. I guess at $500 it’s worth a gamble. You do know you can just go to Google Adsense site and have it send you an email daily monthly whatever with your earnings which said email would go cha ching on your phone anyway…..I’m honestly amazed anyone bought it. I’ve thought about developing my own software (not necessarily an iPhone app), like how you’ve developed Long Tail Pro. As a non-programmer myself, how difficult is it to communicate your idea to a programmer and have your ideas come to life? Is it tough to find a good developer? How do you know what is a good rate or project rate to pay them? As a developer, any kind of documented use-cases are key. Written narratives of how a user would interact with the software, storyboards of chronological use, flowcharts of “A then B then C”, etc. Draw pictures of what each screen might look like. List what roles different users might have and what they’re allowed to do and not do. Show them another app that’s like yours or has features you want. The more detail you provide, the closer you and your dev will be to being on the same page. If you say “I want an app that let’s someone do X” and then hire someone without much more detail, there’s a really good chance they’ll give you something completely different from what you had in mind. But, if you say to your dev “The user will see Screen X with options 1, 2, 3, and in order to do Y, they’ll click on [something] and then enter [something else]… etc etc etc”, it takes the guess work out of the equation. Unfortunately, there are developers (and I don’t think this is the right thing to do) who will make too many assumptions about what a project manager wants. That only leads to more fixes, longer projects, and expanding budgets. Its not easy, but doable. Typically, the more expensive developers tend to be easier to work with – and can interpret what you are looking for much better. A good developer can cost anywhere from $75 to $150 an hour – it all depends on the project. I have long been hoping for a LTP app as I am often on the road and get tons of ideas that would be great to plot into an LTP app. 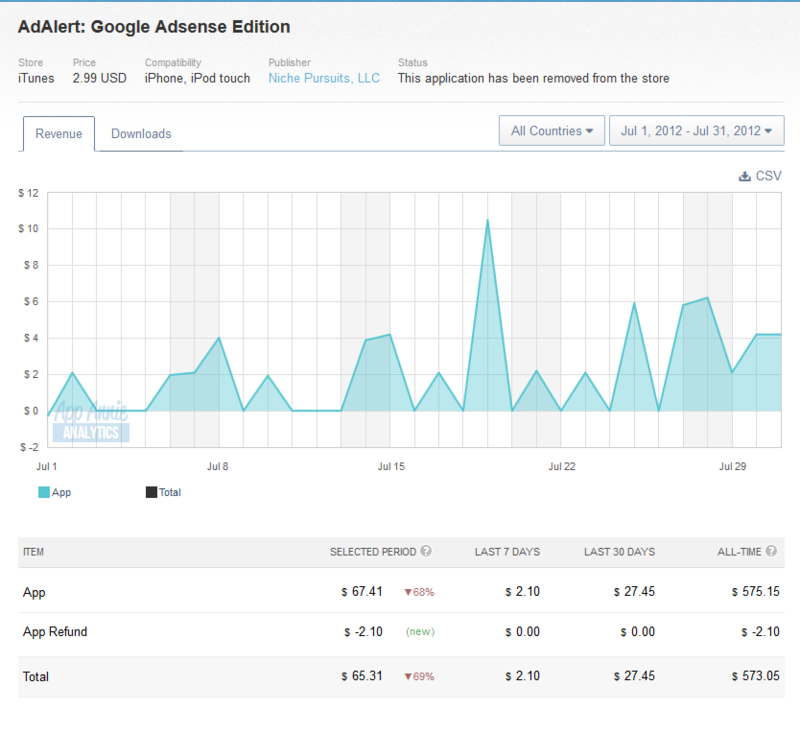 However,would it not too be the same as the adsense app in terms of one IP trying to access Adwords tool? Or? Any way – as always a pleasure to read your posts – very inspirational and informative. I’ve thought about developing an app before, but I haven’t been able to justify the development cost with anticipated benefit. Many people (including myself) expect apps to be free or close to free ($2.99 or less). If you spend $2K building an application and consider ongoing maintenance cost over time it’s a tough business model. You have a sell a ton of apps at that price point (considering ongoing maintenance) or you have to create an application that requires additional in-app purchases. Obviously, there are several success stories, but likely an equal or greater number of failures too. Hi Spencer , I really appreciate today’s post . It’s great to learn from mistakes and failures . I’d like to know more about your niche website failures as well as what you learnt from It , This way we can avoid what you fell into . Thank you so much .You always inspire me . Wish you all the best . Thanks Mark for sharing this great experience ! I hope your next app will be more successful. I said “more” because even if this app failed, you learnt a lot of things and made a nice $500 and it’s also a success. As others have said, there ain’t nothing wrong with admitting a failure or loss. In a world of too-good-to-be-true gurus, it’s refreshing to see an honest person reporting the ups and downs of Internet marketing. Meaning, you learn from your failures, and as you speed up your rate of trying out — and failing at — new ideas, you accelerate your successes as well. Keep doing what you’re doing, Spencer. We’re loving it! As a developer (but not for apple/ios), it sure seems the app could have pinged adsense directly from the phone and avoided the whole single-ip problem? Unless there’s a restriction for iphones that prevents this, but doesn’t seem there would be. We looked at this; and it wasn’t doable. I’d have to go back to my emails with my developer to explain exactly why; but this was the first think I wanted to do, but if I recall correctly it needed to be processed through a server (an iphone query wouldn’t do). This would be my main concern here: I think the app was architected wrongly from the start. You are reliant on the developer(s) as domain experts to give you good advice. I too am a developer (not IOS) and I’ve managed many, many developers who give you duff advice / research. This is why you need a level of expertise yourself to be able to challenge them – give them another lateral path – and set them on their way again. Developers – rather than saying anything is possible – are often restricted by limiting beliefs and knowledge. To me this is one of the fundamental dangers of outsourcing jobs which you have limited domain knowledge yourself. Good points and the advice is well taken. Will you be making the code open-source? Thanks for sharing Spencer. I think all TRUE entrepreneurs have a failure or two (or more) along the way! I have certainly folded on a few ventures myself. While it frustrates parents, spouses, and friends at times I think having the guts to admit defeat and keep moving on with new ventures does lead to success. If anything you have proven that it is VITAL to not tie yourself to just one thing. . . there is no one “perfect” business. The only great business is one that makes money and works for you. I was going to say what paintball barrel guy suggested. Spencer, why didn’t you have each user’s phone ping Google directly? It seems like that would solve the problem. Failing is an essential part of learning in any business. Admitting it to yourself and cutting your losses can be difficult, as can admitting it to others. Your bare all approach is inspiring and appreciated by many (if not all) of your readers. I know a few people who have put blood, sweat and tears into iPhone apps with a pretty unjust return considering the work. I know there are people making money at it and if you have an idea you think can work then go for it but I wouldn’t recommend anyone trying to build an app because they want to have a place in the app store. Thanks for your openness as always Spencer. Your readers learn as much from things that go wrong as things that go right. As you know of course. Thanks Fran for the support…and its good to hear that people are open to hearing the failures as much as the successes. Thanks for sharing Spencer. It’s a cliche but it’s true – you learn more from the losses. For months and months I worked hard getting the book written, on Amazon, on Kindle, setting up a blog, trying a consulting business, and starting a podcast, and only after nearly 8 months and a couple thousand dollars lost did I realize that the market size was just not big enough for what I was trying to accomplish. But guess what? It was all worth it because I will NEVER make the mistake of picking a too-small market again. Charlie Munger often says that it is highly beneficial to try to learn through others’ mistakes more than our own. And it is. But man, the mistakes you make yourself are the ones that you really feel and never forget. It’s all about learning and growing. Thanks again for sharing. Well said Jason – thank you for sharing! Personalize experience is a great teacher. I wonder what % of apps actually ever recoup their original investment…I’d bet it’s a rather small number. I find it interesting that at least some of Pat Flynn’s app ideas were just for fun and had no tangible purpose whatsoever. But I wonder whether that was something that did OK for awhile, but has died off with the novelty of the idea. It certainly must be difficult getting noticed in a field as crowded as the App Store or Google Play. I suspect promotion of really successful apps often involves as much time or money as the development process did. I think winning is awesome but failure teach us what we need to be doing in order to see more success. I learned this recently when I started my first niche site and made the 2 biggest classic niche mistakes, not using exact match when searching for keywords and not studying the competition hard enough. What I really feel makes success is just doing the right things long enough, because as long as you are doing the right things success is inevitable. Thanks for sharing your story Spencer. Oh No, that’s is sad news, I use this app all the time !!! I never earn much and its never gone Ker-ching for me but I loved it. I reckon I would have been one of your first 100 buyers of the app so I’m really sad its gone. Maybe you can revive it one day with new functions and try again…here’s hoping. Thanks for your continuing hard work to teach us all how to move to a higher level. Great post, Spencer. There are far, far too many BS-artists out there who yammer all day long about how smart they are and how they are always successful. There are far to few actual ‘doers’ who get in the trenches and honestly report on their failures as well as their successes. Interesting to me how many “you paid too much” and “you did it all wrong” comments there are. Monday Morning Quarterbacking at it’s finest … *sigh*. One little stat regarding failure and persistence I came across not long ago … there’s a little Finish development company called Rovio. They published something like 49 iPhone aps that were essentially total failures. Then they released number 50 … a little goofy thing called “Angry Birds”. Cut the losses when you have to, but never give up guys and gals…. Great, great comment Dave. “There’s a little Finish development company called Rovio…” Love that! Hey Spencer, what about your customers, did they get their money back? Anyone that bought the app is welcome to ask me for a refund. (I should clarify that the part of the app that checks and displays your earnings still works). Thanks Spencer for talking about this,and being so honest,this really helps me,although it has not put me off,it gives me food for thought,keep it real,thanks again Mal.got some good info about this recently i will forward it to you,if you want? Hey if only there were more like Spencer who would be willing to spill the beans and be honest,and then we would see what really works and get rid of all the garbage out there would save a lot of sifting work,keep it up Spencer and i will always be a fan,thanks Mal. Is Long Tail classroom different than the videos that come with LTP? Yes, totally different. (Unless you bought an upsell after Long Tail Pro – the upsell is Long Tail Classroom). Hey Spencer. You gave it a shot and that’s more than what some people can say. The app business is tough for sure cause of the competition. I definitely think when we’re bootstrapping it, it’s better to put out a bunch of smaller apps instead of trying to hit a home run. Though Photo 365 did well, my second app is doing better now after a slow start, but my third and fourth are not making money for me. The last two I spent way too much on them for making so little money. So I’m going to try and make it a numbers game now instead of trying to create the next big hit. Having just listened to your podcast with Benny (catching up on older ones I haven’t gotten to yet), any information on his further efforts, as well as your report here, are of tremendous value. Much for us to learn from attempts that were struggles and even failures, not just the successes. Although you may be chalking this one up to a learning experience, I am glad you shared it with the rest of your readers. All to often I read the success stories which can cloud one’s vision to how complicated the process can become. Your experience helps me take a step back and focus to really evaluate an idea before implementing it. Thanks. Spencer – you’ve got a creative mind and I am looking forward to the types of ideas you come up with when you have a go at apps again. we’ve all had our share of business losses, it’s just part of the learning curve and I know I am preaching to the choir. most often we come out of it better, more effective and usually profitable. I was nervous about the results as well before going live with my apps, especially because one of them isn’t “original”. I took a concept, improved it a bit (my opinion) and released it. what I have realized in the less than a year or so of doing this is is that you will manage to attract some sales even if the idea is already taken by another app, and if your development cost is low, then it’s fairly easy to recoup the investment and profit the rest of the way for as long as the app sells on itunes. in any case, will be keeping a close eye on your progress with apps. can’t wait to see your ideas come to fruition. I remember reading this when you first posted about it. I often wondered what happened to the app so thank you for revisiting. ‘Success is a terrible teacher’ so it’s important to learn from failure and treat it as part of your ongoing business education. Do you have any new ideas for another app? Thank you for being one of the few who not only shares success stores, but failures as well. Your lessons learned will be very helpful to me. It would have saved me hours of checking my stats. Such a waste of time…habit I am trying to quit. Did you ever thought of taking the app and repurposing it? It may not work for Adsense, but perhaps like an affiliate sale alert. Originally I was thinking I could do this, but since the app didn’t work as planned, I scraped those ideas. Mediocre leaders hide their failures, preferring the limelight of recognition and ego stroking. Great leaders admit their mistakes. In my book, you’re a member of the latter group. Not everything we attempt succeeds, because if it did, everyone would be doing it and where’s the challenge in that? You’ve learned from your mistakes and failure. Maybe you’ll try another ap, maybe not. But with the next attempt you can build upon what you learned from the first expeience and at least be that much farther ahead of the game..
And that’s how success is achieved. Good pof you to share. Now I know that I’ll probably never venture into the ap field. 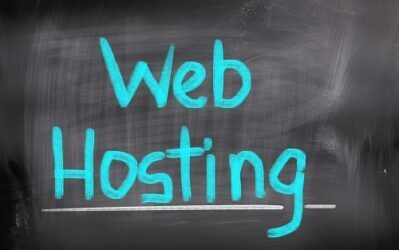 I’ll concentrate on building my sites fo rnow, based on primo information I get from you. Great post Spencer. I have built some iPhone apps and have seen similar sales trends. The problem with this app is not that it wasn’t successful, it was that Google kept blocking your ip so the app didn’t have enough time to be successful. Had that problem not occurred, it probably would have worked out. If you go long tail you have to wait some time to recoup your costs. I am trying a similar niche approach in the app store so I’ll let you know how it plays out. Thanks again for the great post. I think this app had lots of potential but where it might have gone wrong is that you didn’t have complete control. If the app wasn’t reliant on external third parties such as adsense you could have easily made this a successful business venture. I would definitely give it another run! Is like any other business there are chances of failing and chances of succeeding you just need to keep trying. Spencer, a general question, but what plugin to you use for these comments? Thanks. I don’t use a plugin; its just standard wordpress comments. Interesting journey, Spencer. Thank you for sharing it with honesty, transparency, and integrity. That has come through very clearly on this journey, and will bring you untold success simply because of these choices you make each day. As for the future, save the app for Rippln. If you aren’t in yet, let me know and I will send you a personal invite. I think that’s worth a try and what was more important here is the lesson you learn. I guess I am more excited to see what you are going to do next after this failure. The process never stops and I am sure you are now after for something big this time. Spencer, to be honest, the thing I took away from this is similar to what I’ve taken away from niche sites: don’t make your business model something where Google (or anyone else, for that matter) can just pull the rug out from under your feet. Well it was worth a try.Every experience is never a failure just another lesson to learn from. I had similar experience with app development and although it was never profitable, it helped bring in more opportunities through the network it created. Do you have any advice how I could do research for possible buyers? How did you do it back then? And a great example of the importance of sharing our “failures” and “mistakes” along with our successes. But like everything in life, when you’ve learned from it, it’s really a lesson. I’ve created my own photo app, pretty much all on my own, and have been documenting my “newb app developer” journey. thanks for sharing. You are the same like me. I failures for my first apps. I did not research well. Sold 100 copies per month but building cost me 2000-5000 depends on complexity. After I ready this blog, i will keep continue building differently app. I will not give you that people say is for a learning lesson. Maybe next app will be better. Thanks for taking the risk and then sharing. It’s been proven people learn as much by watching someone do it wrong, as doing it right. Another odd thing is that when Hollywood releases a war movie about a defeat (A Bridge Too Far, Black Hawk Down) army recruiting goes up. So you’ve probably inspired a host of others to try to make an app. Thanks for the information Spencer. As a rookie iPhone developer, I’m putting the functions together in my head that would make such an app like yours work. My conclusion is that you might want to consult with more developers and get more opinions about the feasibilty of your app. It really is a good idea. And you are right, promoting the app would have been a catch-22. I agree…I need to go back and have someone look at this. Pointless and stupid…just like your app.